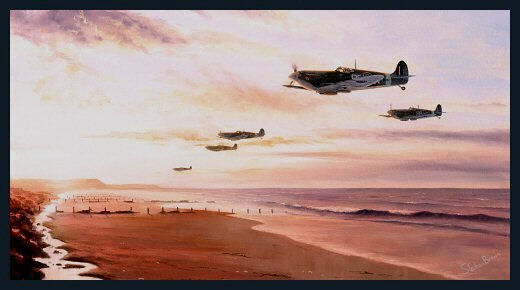 Spitfire Vbs of 303 Squadron over the East coast of England, returning from an early morning sortie over the North Sea. RAF No. 303 "Kościuszko" Polish Fighter Squadron was formed in Britain as part of an agreement between the Polish Government in Exile and the United Kingdom and became one of several Polish squadrons fighting alongside the Royal Air Force during World War II. A number of RAF units were made up from exiled pilots from allied countries: 303 Squadron was the highest-scoring of these allied units in the Battle of Britain and fought with distinction to the end of the war.